Thanks to the dozens of citizens who participated in the public hearings hosted by the U.S. Coast Guard (USCG) at the Ponderay Events Center, on Wednesday, March 13! The heartwarming demonstrations of strong, thoughtful, regional resistance to the Burlington Northern Santa Fe (BNSF) Railway proposal to build second train bridges over Sand Creek and Lake Pend Oreille in Sandpoint and Bonner County witnessed 23 of 29 testifiers speaking against the project: All seven at the 8 am meeting, and 16 of 22 at the 6 pm proceedings. Collectively and abundantly, our community possesses plenty of knowledge and passion to heavily supplement the project’s public record with counter-information, and to exhaust all administrative remedies, as we expect better outcomes than from rigged, state hearings and comments. Offering most of three hours of testimony on the inadequate, draft environmental assessment (EA) for the BNSF Sandpoint Junction Connector project, opponents raised concerns about rail infrastructure expansion impacts on air and water quality, lakebed, mining and coal pollution disturbance, bull trout and other fish, nesting birds, construction noise, traffic, and economic effects, related industrial ventures, lake earthquake scenarios, global climate change from coal- and oil-by-rail exports, catastrophic, oil and hazardous chemical derailments, and more railroad neglect of spills into the watershed [1, 2]. Critics also faulted the draft EA with failure to engage and consult Native tribes and to consider recent seismic activity in bridge plans, overly optimistic impact projections, and insufficient spill-response plans and equipment, all calling for an independent, full environmental impact statement (EIS) under the National Environmental Policy Act (NEPA). 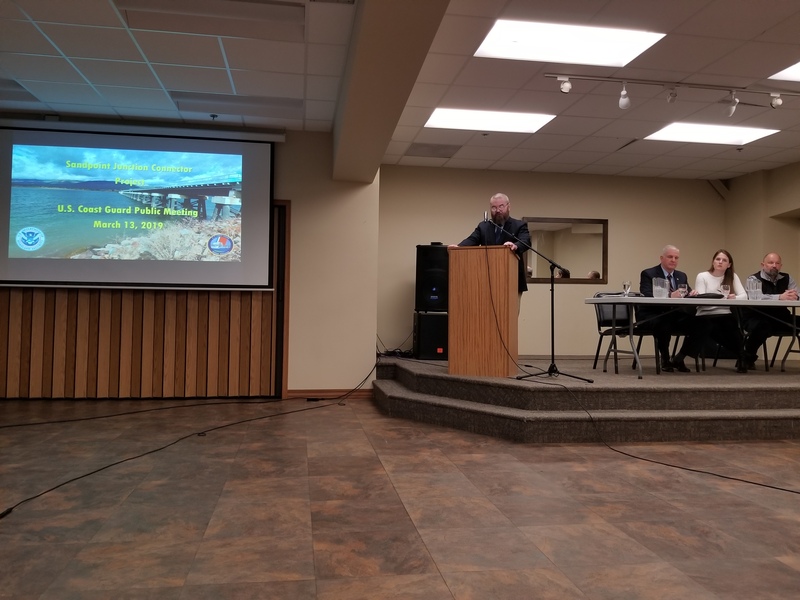 Six railroad supporters, trackside residents, and apparent, labor union, bridge construction accomplices voiced favor for the purported economic benefits, relieved road and rail traffic congestion, and reduced semi-trucks of displaced railroad freight anticipated by the project. They talked about elimination of train and vehicle bottlenecks across the lake and at crossings, track maintenance and safety, and the supposed success of the U.S. Highway 95 Sand Creek Byway. Drawing on insights from our ongoing, state encroachment permit lawsuit, Wild Idaho Rising Tide (WIRT) activists provided several, legally defensible points extemporaneously and prepared from our research, email alerts, and comment suggestions offered by other groups [3, 4]. 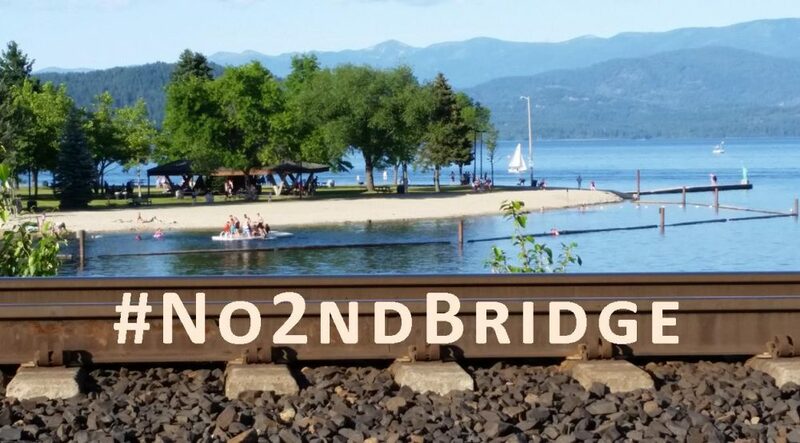 In our oral comments, we noted regional and nationwide, BNSF derailment numbers, conditions, and history, possible connections between the proposed, Newport, Washington, silicon smelter and BNSF bridge and track expansion in north Idaho, and lack of USCG notification of navigation-impact commenters about a subsequently prolonged comment period and changed, lake and creek bridge designs, which drew audience gasps. WIRT also mentioned incomplete or non-existent consultation with the U.S. Fish and Wildlife Service on threatened bull trout and its critical habitat in the project area, and with regional, sovereign nations, except the Kootenai and especially missing the Confederated Salish and Kootenai Tribe of a WIRT board member. However, WIRT activists were surprised by allied organization’s unnecessary, public statements at the hearings, about their neutral positions neither supporting nor opposing the BNSF bridge project, which foist the burden of commitment to court challenges and physical resistance of agency decision and permit outcomes on overworked, volunteer, regional community groups. We have received no replies to our request for their explanations of motivations behind these most disheartening remarks. WIRT photographed and recorded most, but not all, of the March 13, morning and evening hearing testimony for facebook-posting and broadcasting on our weekly, Climate Justice Forum radio program, produced by climate activists for over seven years, for progressive, volunteer, community station KRFP Radio Free Moscow [5, 6]. Besides news and reflections describing continent-wide resistance to fossil fuel projects, the root causes of climate change, and related topics, we aired the morning hearing during the last half-hour of the March 13 show, and the first half of the evening hearing on the March 20 edition, both temporarily available for listening on Radio Free America, by searching for KRFP, and viewing its full archive of Wednesday shows . Tune in to 90.3 FM and online next (and every!) Wednesday, between 1:30 and 3 pm Pacific time, to hear the last hour of the evening, March 13 hearing . Considering that “public” television and Idaho welcome ads and funds from fossil fuel companies, we are not surprised that an Idaho public television program about Lake Pend Oreille lingered long on depicting Kalispel home lands/waters and lake fisheries issues culminating with bull trout, but never identified it as an endangered species, before the show launched into the railroad history and context of the #No2ndBridge battle (between 34:45 and 38:30), but never mentioned proposed, fossil fuels pipeline-on-rails construction in bull trout’s federally-designated critical habitat in the lake . At least, the one-hour presentation revealed the natural beauty and jeopardized health of our Panhandle region. As the lead, federal agency overseeing BNSF bridge permits and project analysis under NEPA, the Coast Guard needs to hear from north Idahoans and our regional neighbors, via the potentially last opportunity to request that the USCG require additional impact evaluations through an EIS, instead of issuing a finding of no significant impact (FONSI) and final EA. Individually unique comments, which substantively address the deficiencies of the draft EA documents and processes and the BNSF project, provide the counterbalance of local wisdom so crucial to community protection of our watershed. With only days remaining to act, see the WIRT website and facebook pages for further information to assist your letter, and share your earnest, public input efforts with your friends and family. Please search for and review your project issue(s) of concern among the draft EA documents at the federal e-rulemaking portal (http://www.regulations.gov), and identify docket number USCG-2018-1085 in your respectful comments accepted until 9 pm on Monday, March 25. Ask the Coast Guard to include your remarks and accompanying facts in the public record for this project, for an extension to 90 days for this winter-inappropriate, comment period, to better involve seasonal residents, for hearings in the most impacted community, Sandpoint, for considerations of alternative rail and bridge routes, for core samples of pollution in the lake bed, railroad right-of-way/easement, and for a more scientifically rigorous, unbiased, environmental impact study and statement examining this BNSF scheme. WIRT activists eagerly anticipate and appreciate everyone’s initiative, expertise, and advocacy during this decisive, project review phase. If you cannot find time to write to the Coast Guard about its insufficient, federal, environmental review of proposed, north Idaho, BNSF bridges, we encourage you to sign with comments WIRT’s Petition to Deny and Revoke Permits for the BNSF Sandpoint Junction Connector Project, which lists significant impacts of railroad bridge construction and operation on air, water, environmental, scenic, and economic qualities and values, native fish, wildlife, bull trout, and their habitats, indigenous cultures, treaties, and rights, increased train traffic, noise, and toxic coal and diesel pollution, hazardous materials and bi-directional derailments and disasters, railroad negligence of the health and safety of workers and rail corridor residents, impeded navigation, emergency, and vehicle travel, recreation and tourism enjoyment and businesses, vulnerable historic sites and private properties, and other, pertinent factors . WIRT and allied activists and our attorney are thrilled about Judge John Judge’s six-week deliberation and delay of his decision on motions to dismiss filed by lawyers for the Idaho Department of Lands, State Board of Land Commissioners, the May 23, 2018, hearing officer, and intervenor BNSF in mid-January 2019, and argued during a telephonic hearing on February 8 . In ongoing, good faith, we gratefully await a thoughtful and well-reasoned ruling in early April or later, arising from the judge’s authority to dismiss in whole or in part the state/BNSF dispositive motions and/or our petition for judicial review of the state encroachment permit issued to BNSF in June 2018. THANKS to the dozens of generous contributors who have covered about 40 percent of our case costs over the last eight months! We still need your support of WIRT lawsuit expenses, as we hope to move forward with defending, supplementing, and arguing our strong, mid-December 2018, opening brief, despite attempts to obstruct and divert attention away from its substantive merits. Please pitch in toward our grassroots, crowdfunding campaign, through our website “Donate to WIRT” buttons, our Moscow and Sandpoint mail boxes, or at our Eighth Annual Celebrations of Wild Idaho Rising Tide, featuring a poetry open-mic and benefit concerts, at 7 pm on Friday, March 29, at The Attic in Moscow, and at 7 pm on Saturday, March 30, at the Gardenia Center in Sandpoint [12, 13]. Among extensive, No2ndBridge comments composition, we plan to finalize arrangements and announcements for these events soon ! Thanks!